We hope you have noticed the new graphics in TCOTC’s upgraded entryway! Each represents one of your Club’s Values: Community, Fun, Diversity, Learning, Leadership and Safety. The pictures feature actual club members, human and canine, representing TCOTC values in action. 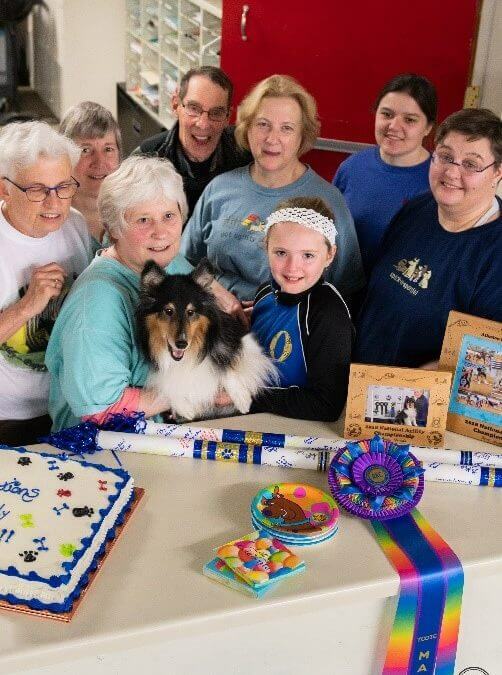 Reneé Foster (seated) is holding Teddy, a Sheltie owned by Carol Brandenburg (far left). They are celebrating Teddy’s amazing success at the 2018 AKC National Agility Championship in Reno, NV. Reneé, who is a TCOTC member and instructor, was Teddy’s handler in this high level competition. The results speak to Reneé’s excellent handling skills. In three clean runs, Teddy placed 9th out of 150 dogs in his height category and earned a spot in the championship finals. Also featured in this photo are members Scott Chase (middle rear) and Ava Gardner (middle front). Scott and Ava are neighbors in what Scott calls a “true neighborhood,” where everyone knows each other. So he wasn’t surprised when, once he started training his Swedish Vallhund Ӧcho in agility in his front yard, the neighborhood kids got involved. Of all the kids, 10-year-old Ava was especially impressed. Ava asked Scott, “When are you going to train next?” “Tomorrow at 2:00,” he told her. And sure enough, by 10 minutes to 2:00, Ava was out in Scott’s yard setting up jumps to get ready for practice. Soon Ava began training Ӧcho herself. She learned quickly, worked hard, took advice and guidance from Scott, and was very tenacious. Now Ava does all the handling and training. “It paid off big for me!” says Scott. Ava and Ӧcho now practice during Open Ring time every Thursday at TCOTC. Ava’s mom, Trisa Lucas, has even incorporated agility as part of Ava’s home schooling. The sport provides recreation, and it also teaches patience and discipline, while Ava learns about dog behavior and training. Before Scott began training Ӧcho in his yard, Ava had no idea what agility was. She’s learned that, even though it looks easy, it isn’t. There is always something to learn and problems to solve. When a dog makes a mistake, you have to figure out how to fix it. “Usually it’s my fault,” says Ava, “or both of ours.” Her perseverance has paid off: She and Ӧcho are competing at Masters level, with Excellent within reach, perhaps even before her 13th birthday this spring! Ava has also joined Scott as a trial volunteer. She’s done every job except scribing. “When she sees a job that needs to be done, she does it,” her mom explained. Participating in agility has brought Ava into a community of people who love the sport and support each other. “Everybody wants everyone else to do well,” says Ava, “and everyone supports each other when things go bad. Once, Ӧcho peed in the ring – a huge embarrassment! But others immediately comforted her by sharing their own “horror stories” in the ring. We’re happy to have Scott, Ava and Ӧcho as part of our community at TCOTC! TCOTC is a nonprofit organization committed to strengthening the relationship between you and your dog. We provide low-cost training opportunities in basic obedience, agility, flyball, tracking and therapy dog work, using principles of positive reinforcement and operant conditioning.